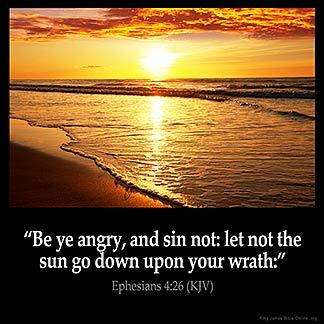 EPHESIANS 4:26 KJV "Be ye angry, and sin not: let not the sun go down upon your wrath:"
23And be renewed in the spirit of your mind; 24And that ye put on the new man, which after God is created in righteousness and true holiness. 25Wherefore putting away lying, speak every man truth with his neighbour: for we are members one of another. 26Be ye angry, and sin not: let not the sun go down upon your wrath: 27Neither give place to the devil. 28Let him that stole steal no more: but rather let him labour, working with his hands the thing which is good, that he may have to give to him that needeth. 29Let no corrupt communication proceed out of your mouth, but that which is good to the use of edifying, that it may minister grace unto the hearers. Be ye wrooth, and nyle ye do synne; the sunne falle not doun on youre wraththe. 4:26 Be ye angry, and sin not - That is, if ye are angry, take heed ye sin not. Anger at sin is not evil; but we should feel only pity to the sinner. If we are angry at the person, as well as the fault, we sin. And how hardly do we avoid it. Let not the sun go down upon your wrath - Reprove your brother, and be reconciled immediately. Lose not one day. A clear, express command. Reader, do you keep it? Eph 4:26 Be ye angry, and sin not. Quoted from Ps 4:4, Septuagint Version. Do not sin through anger is the thought. If circumstance arouse your indignation, do not be led astray. Let not the sun go down upon your wrath. Let there be no long continuance of your wrathful mind. Concerning Christian 's comment on 2 10 14 I had not looked at it that way before That is a good thought To reverence God is to have a wholesome healthy dread of displeasing God with a hatred for evil anger is evil sin is displeasing to God. Encouraged by your thought. Thanks . We should keep ourselves in the love of God To keep ourselves from the wicked one. I needed to read this scripture this morning, I 'm angry this morning need to read the word feeling better asking God to show me the way to handle this feeling. In Genesis 37 9 10, the sun is refering to Abraham, or the father, further into imagery, the sun means father or God. When you are angry, do not turn from the light of God, for if the light of God is not shining upon you, your anger will turn to wrath. It is through the power of God 's light shining upon us that keeps us from sin. If that light goes down, or we step away from it into the shadows, then our anger could soon turn to sinful wrath.